Hey all. Spent the morning in Urgent Care with Carole, not heart related, and she will be fine in a week or two. 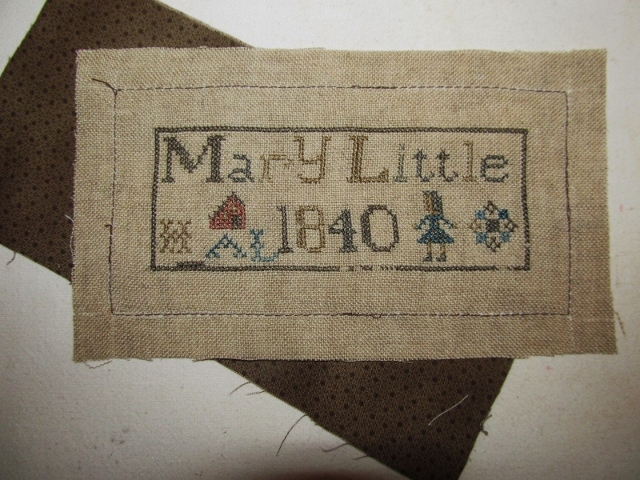 Came home and decided to finish Mary before I misplace her being that she is so tiny. Size doesn't really matter because I've lost much larger pieces but it sounded like a good enough reason. And it's always a brilliant move to tackle a potentially stressful project after a stressful morning. I used a different method this time, without interfacing. I still prefer the stability of it but this linen is substantial and I've wanted to try this for a while. 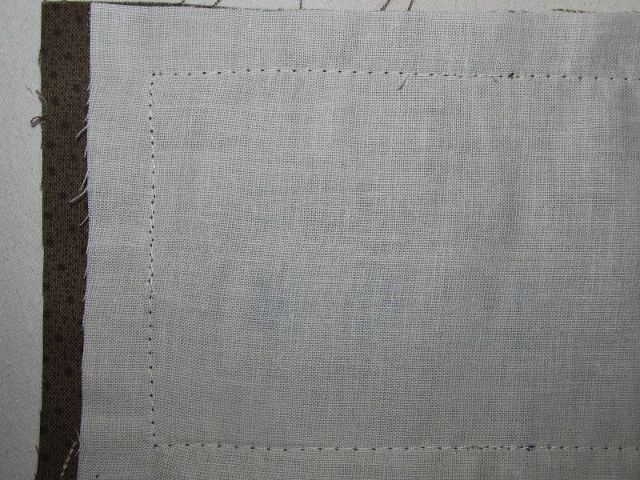 As always I counted out on all sides and removed a linen thread, further out than where the seam would be, and then ran the Frixion pen in that ditch to make sure I could see it at the sewing machine. 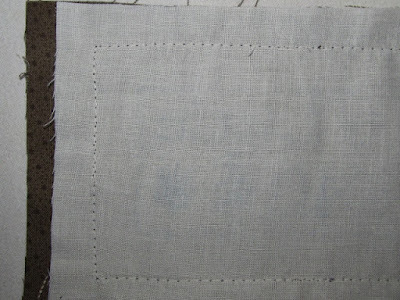 Machine sewed on this line, right side of the linen, while attaching the muslin on the back, creating a visible guide to follow when sewing the backing on right sides together. Just 1/8" in from this stitched line and I hoped it would line up the linen threads and be rather straight. Bingo. Not bad at all. I wanted something thin and dark brown for the hanger, used a braided brown shoestring. She fits nicely in the carrier, but with the longer hanger, she can visit more places. so I moved her to a small primitive cupboard. This was stuffed before, but once we start cleaning walls and clutter, everything is minimized. Only half the items are returned to their former position. That's all folks! Once again, loving the very small projects. 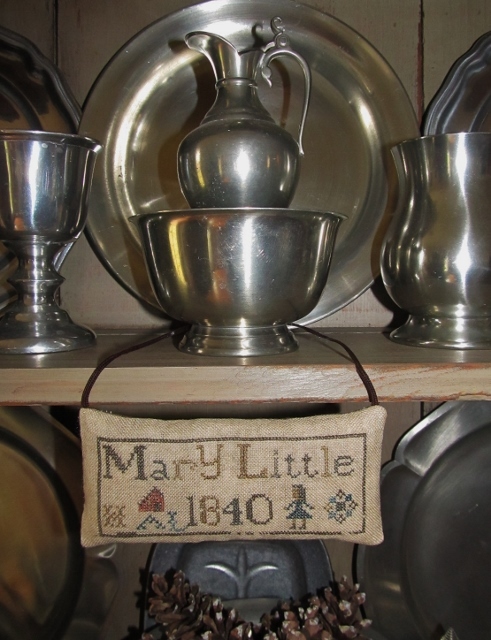 I think Mary is such a sweet piece and looks so nice with the hanger!!! That gives you more options and if you decide to tuck her somewhere, you can just tuck the hanger behind!! Hope you and Carole get some rest and renewal!! 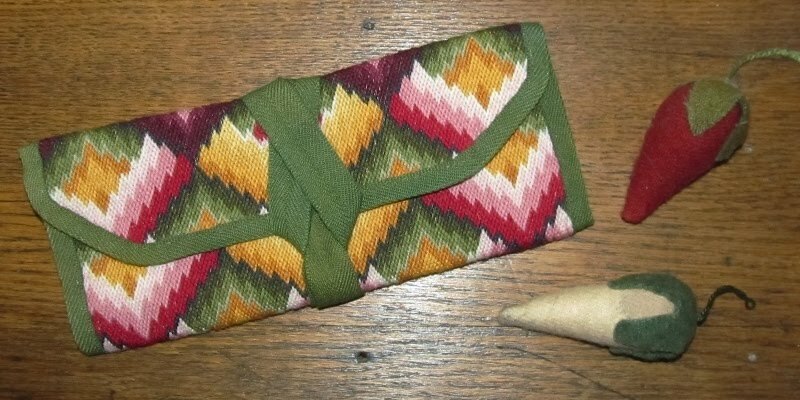 Stitching is so good for the heart and soul!! Enjoy your day and thanks for sharing! Love the finish and the other smalls you have displayed. Lovely finish, Marky. Mary is charming. Glad Carole is going to be OK. Such a sweet finish. You are so productive. Here's to Carole's speedy recovery. Mary looks good hanging on a 'shoestring'. Sorry to hear about Carole's trek to the ER. Hope you are able to get some rest yourself. Mary is sweet and beautiful. 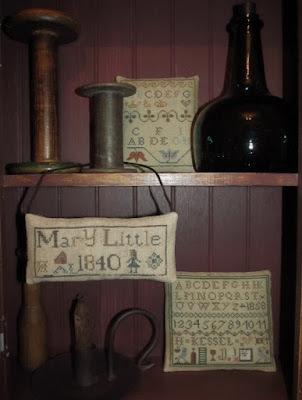 Mary is adorable--and I'll have to remember the shoestring hanger idea! Glad to hear Carole will be fine in a couple weeks. I'm sure it is very stressful for you to watch her struggle with her health. She is very lucky to have you nearby, Marly! Hope you and Carole can rest and revive!! I do love Mary... Just my speed these days. Might consider doing her...Mom's name is Mary too, so I would probably alter the date to 1919??? maybe. Have a pleasant week and thanks for sharing. Mary is perfect. Carole is in my prayers.